Currently, the database has over 2,600 photos of over 180 varieties from East, Central and East African banana and plantain collections. The ECA region has over 50% of its permanent cropped area under banana cultivation, which represents around half of the total area under banana cultivation across Africa. The ECA countries (Burundi, DR Congo, Kenya, Rwanda, Tanzania, and Uganda) produce annually 21 million tons of banana with a value of US$4.3 billion. Despite their importance, their yield levels are extremely low—way below their potential. The current production figures for Matooke at 5‒30 t/ha/year are less than a half of the yield potential estimated at 70 t/ha/year; for plantain, the current yield at 4‒12 t/ha/year is around a third of yield potential of 35.5 t/ha/year, while for Mchare, current production at 11 t/ha/year is less than a fifth of the yield potential of 60 t/ha/year. Factors contributing to the low yields include a plethora of pests and diseases that attack the crops. The International Institute of Tropical Agriculture (IITA) initiated its banana and plantain breeding program nearly 40 years ago, working in partnership with national programs, to develop improved, high-yielding varieties that are resistant to the major pests and diseases. This collaboration has seen the release of several improved high-yielding hybrids of plantains, dubbed PITA, and of cooking bananas, developed with Uganda’s National Agricultural Research Organization (NARO) and hence named NARITA (NARO-IITA). However, breeding of banana is a long and arduous task due to the sterile nature of banana and its limited genetic diversity. Furthermore, local banana and plantain varieties often have many synonyms and different varieties have been found to have the same name. This leads to considerable confusion among researchers and can hamper the impact of their research on society. Researchers at IITA are therefore developing an image database to aid in identifying the different varieties of banana to support and enhance breeding efforts of Matooke, Mchare, and plantain in SSA. 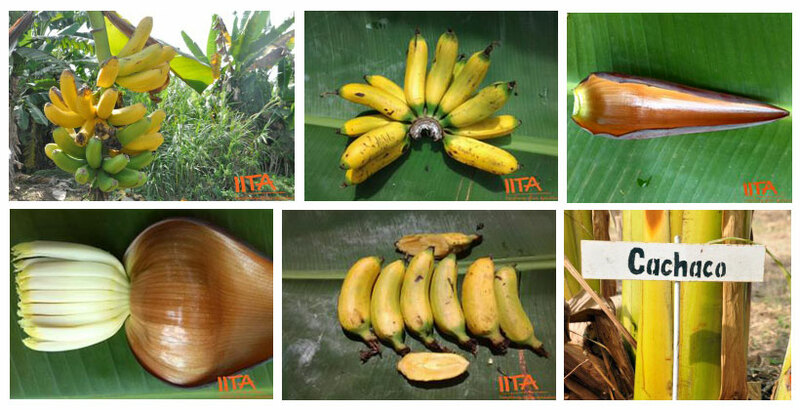 The images show different plant parts and growth stages of 185 different varieties grown under field conditions in the IITA banana and plantain collections in Arusha/Tanzania, Sendusu/Uganda, and Ibadan/Nigeria. It has 2,690 images available on Musabase (http://musabase.org), the global Banana Breeding database developed as an integral part of the Breeding Better Bananas project. As a reference for checking the identity of plants in the field. To identify differences due to environmental influences. To relate desirable traits to the morphology of the plants and fruits for breeding. To provide this information to the wider community as an important resource for Big data and image analysis.